Buying a treadmill is not something you do every day, so it is natural to feel a little confused and overwhelmed during the process. There is a multitude to choose from, and each one seems to offer something unique. If you primarily walk, then you do not necessarily need to make sure the one you purchase is constructed solid enough to not turn into a trampoline at high speeds. However, if you mostly run, a lot of thought should go into making your buying decision. The ProForm Power 995 Treadmill belongs to the upper echelon of treadmills and we love it! Keep reading to learn why we love the ProForm Power 995 Treadmill, and why we feel it is a sound choice to introduce to any fitness routine. How Does the ProForm Power 995 Treadmill Work? To ensure smooth and consistent operation, ProForm has given this treadmill a powerful 3.0 Mach Z Commercial Plus motor. To compliment this strong motor, you will enjoy a generous 60″ treadbelt, and speeds up to 12 mph. It also has a Quick Incline control that will raise the deck up to 15 percent with the push of a button. One of the reasons we love this product is because it is iFit compatible. You can use Google Maps to map your route anywhere you want. You can take a casual jog along a scenic coastline, do interval training through the outback of Australia, or sprint down the streets of Paris. It automatically tracks your progress and pretty much guarantees that you will never get bored with your workout. Do make sure that you order the iFit wireless module with your treadmill. If you do not want to use iFit, you can still enjoy a nice amount of variety, thanks to 20 built-in workout apps. Half are designed for performance, while the other half focus on helping you lose weight. What Are the Health Benefits of the ProForm Power 995? The ProForm Power 995 makes it easy, safe, and convenient for you to meet your fitness and health goals. Running does not only improve your physical appearance; it provides a long list of health benefits. It slows down the aging process, strengthens bones, promotes a healthy cardiovascular system, and reduces your risk for cancer, type 2 diabetes, heart disease, and many other medical conditions. 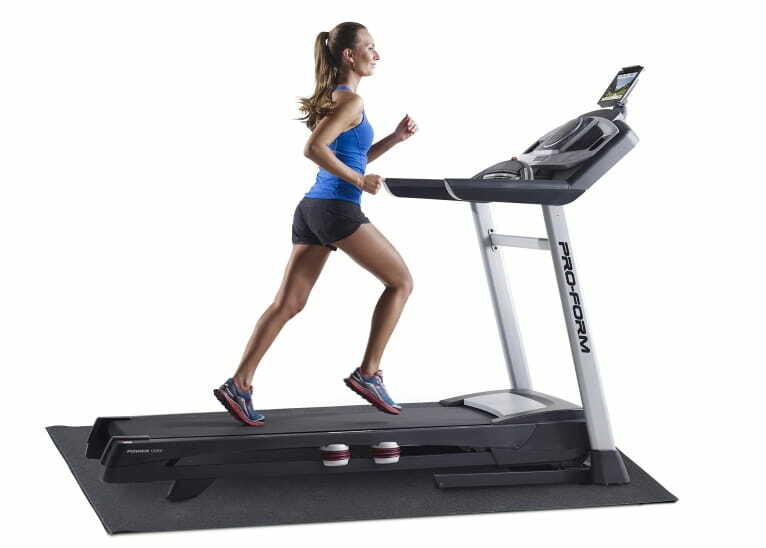 We love that this treadmill features ProShox Elite 2 cushioning. This absorbs impact, thereby reducing the amount of stress placed on your back and joints. Also, the 15 percent Quick Incline is a huge benefit. Working at an incline burns more calories while also reducing impact on your joints. Powerful 3.0 Mach Z motor is capable of handling interval training and speeds up to 12 mph. iPod music port is available to plug your device in, so you can listen through the speakers. SpaceSaver design lets you fold it out-of-the-way, when it is not being used. Quick Incline raises the deck to 15 percent. Roomy 20″ x 60″ treadbelt is welcoming to tall runners. 20 built-in workout apps and iFit compatible ensure your workouts are fresh and exciting. ProShox Elite 2 cushioning absorbs impact to reduce stress on your back and joints. The ProForm Power 995 is a popular treadmill that can likely be found at your local sporting goods store. You can probably find it online at numerous retailers, as well. However, we always recommend buying a product this significant at Amazon. You will not have to deal with transporting it home from the store, and you can make your purchase safely, knowing that it will get shipped promptly. Plus, it is only $999.99 at Amazon, and you get free shipping. It sells for $1,999 regularly, so you really cannot beat the deal at Amazon. If you are looking for a treadmill that can deliver solid performance we recommend the ProForm Power 995. With its long treadbelt, it is even welcoming to tall runners, and we love all the thoughtful features that will ensure you do not get bored with your workouts. Plus, the fact that it is 50 percent off at Amazon is just icing on the cake; virtual cake, of course. Reviews should play a role in the decision-making process of a large purchase. You can read reviews all over the Internet, but Amazon is the one place you can count on them being honest and written by actual buyers; not someone affiliated with the company.